^ a b c d e f g Jacobson, R. A. (2009). 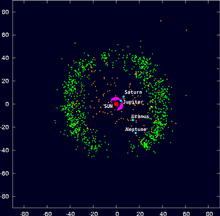 “The Orbits of the Neptunian Satellites and the Orientation of the Pole of Neptune”. The Astronomical Journal 137 (5): 4322–4329. Bibcode: 2009AJ....137.4322J. doi:10.1088/0004-6256/137/5/4322. ^ a b c d e f g h i j k l m n o p q r s t u v w McKinnon, William B.; Kirk, Randolph L. (2014). “Encyclopedia of the Solar System”. In Tilman Spohn. Encyclopedia of the Solar System (3rd ed.). Amsterdam; Boston: Elsevier. pp. 861–882. ISBN 978-0-12-416034-7. https://books.google.com/books?id=0bEMAwAAQBAJ&pg=PA861. ^ a b c Broadfoot, A. L.; Atreya, S. K. et al. (1989). “Ultraviolet Spectrometer Observations of Neptune and Triton”. Science 246 (4936): 1459–1466. Bibcode: 1989Sci...246.1459B. doi:10.1126/science.246.4936.1459. PMID 17756000. ^ a b c d Agnor, C. B.; Hamilton, D. P. (2006). “Neptune's capture of its moon Triton in a binary–planet gravitational encounter”. Nature 441 (7090): 192–194. Bibcode: 2006Natur.441..192A. doi:10.1038/nature04792. PMID 16688170. http://extranet.on.br/rodney/curso2010/aula9/tritoncapt_hamilton.pdf. ^ a b c Prockter, L. M.; Nimmo, F.; Pappalardo, R. T. (2005). “A shear heating origin for ridges on Triton”. Geophysical Research Letters 32 (14): L14202. Bibcode: 2005GeoRL..3214202P. doi:10.1029/2005GL022832. http://www.es.ucsc.edu/~fnimmo/website/Prockter_et_al.pdf. ^ a b Lassell, William (1847-11-12). “Lassell's Satellite of Neptune”. Monthly Notices of the Royal Astronomical Society 10 (1): 8. Bibcode: 1847MNRAS...8....9B. doi:10.1093/mnras/10.1.8. ^ Lassell, William (1846). “Discovery of Supposed Ring and Satellite of Neptune”. Monthly Notices of the Royal Astronomical Society 7 (9): 157. Bibcode: 1846MNRAS...7..157L. doi:10.1093/mnras/7.9.154. Lassell, William (1846). “Physical observations on Neptune”. Monthly Notices of the Royal Astronomical Society 7 (10): 167–168. Bibcode: 1847MNRAS...7..297L. doi:10.1093/mnras/7.10.165a. Lassell, William (1847). 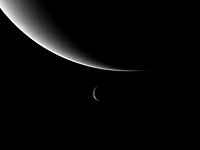 “Observations of Neptune and his satellite”. Monthly Notices of the Royal Astronomical Society 7 (17): 307–308. Bibcode: 1847MNRAS...7..307L. doi:10.1002/asna.18530360703. ^ Smith, R. W.; Baum, R. (1984). “William Lassell and the Ring of Neptune: A Case Study in Instrumental Failure”. Journal for the History of Astronomy 15 (42): 1–17. Bibcode: 1984JHA....15....1S. ^ Moore, Patrick (1996). The planet Neptune: an historical survey before Voyager. Wiley-Praxis Series in Astronomy and Astrophysics (2nd ed.). John Wiley & Sons. pp. 150 (see p. 68). ISBN 978-0-471-96015-7. OCLC 33103787. https://www.google.com/books?id=RZruAAAAMAAJ&q=H.+N.+Russell#search_anchor. ^ Davies, M.; Rogers, P.; Colvin, T. (1991). “A Control Network of Triton”. J. Geophys. Res. 96(E1): 15675–15681. Bibcode: 1991JGR....9615675D. doi:10.1029/91JE00976. https://www.rand.org/content/dam/rand/pubs/notes/2009/N3425.pdf. ^ a b Chyba, C. F.; Jankowski, D. G.; Nicholson, P. D. (1989). “Tidal evolution in the Neptune-Triton system”. Astronomy and Astrophysics 219 (1–2): L23–L26. Bibcode: 1989A&A...219L..23C. ^ a b Cruikshank, Dale P. (2004). “Triton, Pluto, Centaurs, and Trans-Neptunian Bodies”. Space Science Reviews 116: 421–439. Bibcode: 2005SSRv..116..421C. doi:10.1007/s11214-005-1964-0. 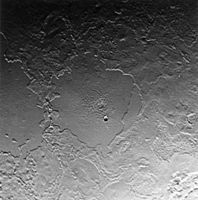 ISBN 978-1-4020-3362-9. https://books.google.com/?id=MbmiTd3x1UcC&pg=PA421&dq=Triton,+Pluto,+Centaurs,+and+Trans-Neptunian+Bodies. ^ Ross, M. N.; Schubert, G. (1990). “The coupled orbital and thermal evolution of Triton”. Geophysical Research Letters 17 (10): 1749–1752. Bibcode: 1990GeoRL..17.1749R. doi:10.1029/GL017i010p01749. ^ Scott S. Sheppard; David Jewitt (2004). Extreme Kuiper Belt Object 2001 QG298 and the Fraction of Contact Binaries. 127. pp. 3023-3033. doi:10.1086/383558. http://iopscience.iop.org/1538-3881/127/5/3023/fulltext. ^ Raluca Rufu; Robin M. Canup (2017年). 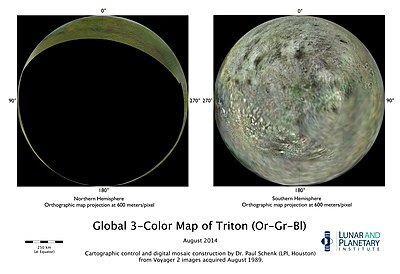 “Triton's evolution with a primordial Neptunian satellite system”. arXiv:1711.01581v1 [astro-ph.EP]. Bibcode: 2017AJ....154..208R. doi:10.3847/1538-3881/aa9184. ^ Ruiz, Javier (2003). “Heat flow and depth to a possible internal ocean on Triton”. Icarus 166 (2): 436–439. Bibcode: 2003Icar..166..436R. doi:10.1016/j.icarus.2003.09.009. ^ Grundy, W. M.; Buie, M. W.; Spencer, J. R. (2002). “Spectroscopy of Pluto and Triton at 3–4 Microns: Possible Evidence for Wide Distribution of Nonvolatile Solids”. The Astronomical Journal 124 (4): 2273–2278. Bibcode: 2002AJ....124.2273G. doi:10.1086/342933. ^ Hussmann, Hauke; Sohl, Frank; Spohn, Tilman (2006). “Subsurface oceans and deep interiors of medium-sized outer planet satellites and large trans-neptunian objects”. Icarus 185 (1): 258–273. Bibcode: 2006Icar..185..258H. doi:10.1016/j.icarus.2006.06.005. 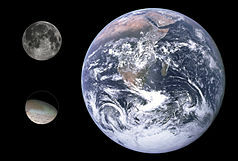 https://www.researchgate.net/profile/Tilman_Spohn/publication/225019299_Subsurface_Oceans_and_Deep_Interiors_of_Medium-Sized_Outer_Planet_Satellites_and_Large_Trans-Neptunian_Objects/links/55018a3a0cf24cee39f7b952.pdf. ^ Irwin, L. N.; Schulze-Makuch, D. (2001). “Assessing the Plausibility of Life on Other Worlds”. Astrobiology 1 (2): 143–160. Bibcode: 2001AsBio...1..143 Check bibcode: length (help). doi:10.1089/153110701753198918. PMID 構文エラー:「i」を認識できません。. ^ Miller, Ron; Hartmann, William K. (2005). The Grand Tour: A Traveler's Guide to the Solar System (3rd ed.). Thailand: Workman Publishing. pp. 172–173. ISBN 978-0-7611-3547-0. ^ Lellouch, E.; de Bergh, C.; Sicardy, B.; Ferron, S.; Käufl, H.-U. (2010). “Detection of CO in Triton's atmosphere and the nature of surface-atmosphere interactions”. Astronomy and Astrophysics 512: L8. arXiv:1003.2866. Bibcode: 2010A&A...512L...8L. doi:10.1051/0004-6361/201014339. ^ a b Duxbury, N. S.; Brown, R. H. (1993). “The Phase Composition of Triton's Polar Caps”. Science 261 (5122): 748–751. Bibcode: 1993Sci...261..748D. doi:10.1126/science.261.5122.748. PMID 17757213. ^ Tryka, K. A.; Brown, R. H.; Anicich, V.; Cruikshank, D. P.; Owen, T. C. (1993). “Spectroscopic Determination of the Phase Composition and Temperature of Nitrogen Ice on Triton”. Science 261 (5122): 751–754. Bibcode: 1993Sci...261..751T. doi:10.1126/science.261.5122.751. PMID 17757214. ^ a b Smith, B. A.; Soderblom, L. A.; Banfield, D.; Barnet, C.; Basilevsky, A. T.; Beebe, R. F.; Bollinger, K.; Boyce, J. M. et al. (1989). “Voyager 2 at Neptune: Imaging Science Results”. Science 246 (4936): 1422–1449. Bibcode: 1989Sci...246.1422S. doi:10.1126/science.246.4936.1422. PMID 17755997. ^ Stevens, M. H.; Strobel, D. F.; Summers, M. E.; Yelle, R. V. (1992). “On the thermal structure of Triton's thermosphere”. Geophysical Research Letters 19 (7): 669–672. Bibcode: 1992GeoRL..19..669S. doi:10.1029/92GL00651. http://www.agu.org/pubs/crossref/1992/92GL00651.shtml. ^ MacGrath, Melissa (1998). “Solar System Satellites and Summary”. Hubble's Science Legacy: Future Optical/Ultraviolet Astronomy from Space 291: 93. Bibcode: 2003ASPC..291...93M. ^ Buratti, Bonnie J.; Hicks, Michael D.; Newburn, Ray L. Jr. (1999). “Does global warming make Triton blush?”. Nature 397 (6716): 219–220. Bibcode: 1999Natur.397..219B. doi:10.1038/16615. PMID 9930696. オリジナルの2007-06-11時点によるアーカイブ。. https://web.archive.org/web/20070611233151/http://www.bio.indiana.edu/~palmerlab/Journals/170.pdf. ^ Gray, D (1989). “Voyager 2 Neptune navigation results.”. Astrodynamics Conference: 108. doi:10.2514/6.1990-2876. ^ a b Schenk, Paul M.; Zahnle, Kevinl (2007). “On the negligible surface age of Triton”. Icarus 192 (1): 135–149. Bibcode: 2007Icar..192..135S. doi:10.1016/j.icarus.2007.07.004. ^ a b c Soderblom, L. A.; Kieffer, S. W.; Becker, T. L.; Brown, R. H.; Cook, A. F. II; Hansen, C. J.; Johnson, T. V.; Kirk, R. L. et al. (1990). “Triton's Geyser-Like Plumes: Discovery and Basic Characterization”. Science 250 (4979): 410–415. Bibcode: 1990Sci...250..410S. doi:10.1126/science.250.4979.410. PMID 17793016. https://www.geology.illinois.edu/~skieffer/papers/Truiton_Science_1990.pdf. ^ Kargel, J. S. (1994). “Cryovolcanism on the icy satellites”. Earth, Moon, and Planets 67 (1–3): 101–113. Bibcode: 1995EM&P...67..101K. doi:10.1007/BF00613296. ^ Kirk, R. L. (1990). “Thermal Models of Insolation-Driven Nitrogen Geysers on Triton”. Lunar and Planetary Science Conference XXI. pp. 633–634. Bibcode: 1990LPI....21..633K. ^ Rubincam, David Parry (2002). 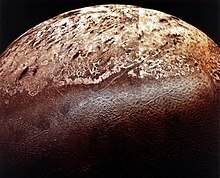 “Polar wander on Triton and Pluto due to volatile migration”. Icarus 163 (2): 63–71. Bibcode: 2003Icar..163..469R. doi:10.1016/S0019-1035(03)00080-0. ^ Elliot, J. L.; Hammel, H. B.; Wasserman, L. H.; Franz, O. G.; McDonald, S. W.; Person, M. J.; Olkin, C. B.; Dunham, E. W. et al. (1998). “Global warming on Triton”. 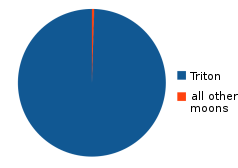 Nature 393 (6687): 765–767. Bibcode: 1998Natur.393..765E. doi:10.1038/31651. ^ a b Collins, Geoffrey; Schenk, Paul (1994). “Triton's Lineaments: Complex Morphology and Stress Patterns”. Abstracts of the 25th Lunar and Planetary Science Conference (Houston, TX) 25: 277. Bibcode: 1994LPI....25..277C. ^ Aksnes, K.; Brahic, A.; Fulchignoni, M.; Marov, M. Ya (1990). “Working Group for Planetary System Nomenclature”. Reports on Astronomy (State University of New York) 21A: 613–619. 1991IAUTA..21..613A. https://ntrs.nasa.gov/archive/nasa/casi.ntrs.nasa.gov/19940014368_1994014368.pdf. ^ a b c Boyce, Joseph M. (1993). “A structural origin for the cantaloupe terrain of Triton”. In Lunar and Planetary Inst., Twenty-fourth Lunar and Planetary Science Conference. Part 1: A-F (SEE N94-12015 01-91) 24: 165–66. Bibcode: 1993LPI....24..165B. 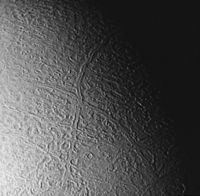 ^ “Diapirism on Triton: A record of crustal layering and instability”. Geology 21 (4): 299–302. (1993). Bibcode: 1993Geo....21..299S. doi:[[doi:10.1130%2F0091-7613%281993%29021%3C0299%3ADOTARO%3E2.3.CO%3B2|10.1130/0091-7613(1993)021<0299:DOTARO>2.3.CO;2]]. ^ a b c d e Strom, Robert G.; Croft, Steven K.; Boyce, Joseph M. (1990). “The Impact Cratering Record on Triton”. Science 250 (4979): 437–439. Bibcode: 1990Sci...250..437S. doi:10.1126/science.250.4979.437. PMID 17793023. ^ Ingersoll, Andrew P.; Tryka, Kimberly A. (1990). “Triton's Plumes: The Dust Devil Hypothesis”. Science 250 (4979): 435–437. Bibcode: 1990Sci...250..435I. doi:10.1126/science.250.4979.435. PMID 17793022. ^ Lunine, Jonathan I.; Nolan, Michael C. (1992). 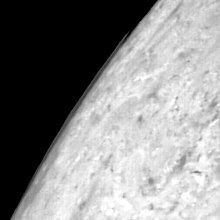 “A massive early atmosphere on Triton”. Icarus 100 (1): 221–234. Bibcode: 1992Icar..100..221L. doi:10.1016/0019-1035(92)90031-2. ^ Cruikshank, D. P.; Stockton, A.; Dyck, H. M.; Becklin, E. E.; Macy, W. (1979). 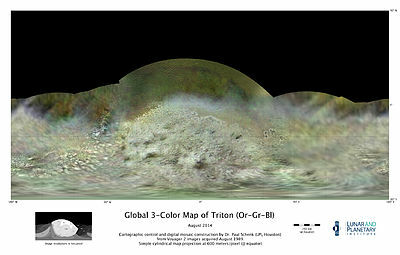 “The diameter and reflectance of Triton”. Icarus 40: 104–114. Bibcode: 1979Icar...40..104C. doi:10.1016/0019-1035(79)90057-5. ^ Stone, E. C.; Miner, E. D. (1989). “The Voyager 2 Encounter with the Neptunian System”. Science 246 (4936): 1417–1421. Bibcode: 1989Sci...246.1417S. doi:10.1126/science.246.4936.1417. PMID 17755996. And the following 12 articles pp. 1422–1501.